We know how much of a tease many of our Deal Alert posts can be for our readers outside the US and Canada, so let's end the year on a more inclusive note, shall we? 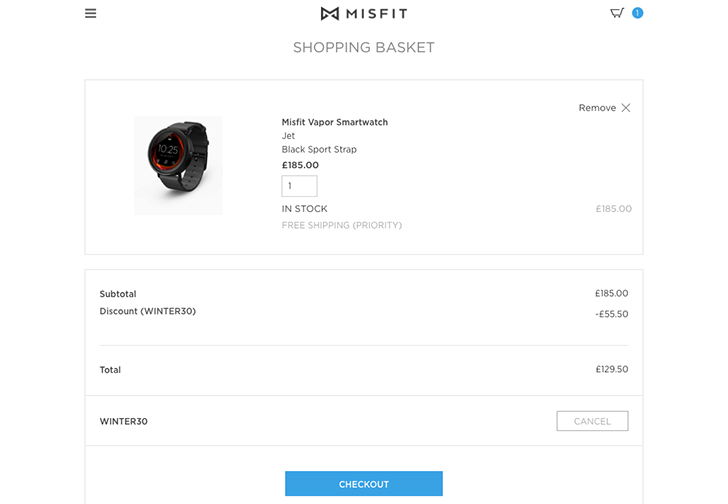 Misfit is giving folks in the UK, Germany, Italy, and France 30% off of its Vapor smartwatch and other products via a promo code. If you live elsewhere, there's a separate promo code to get the same discount on a more limited set of products. If you live in the UK, Germany, Italy, or France, use the promo code WINTER30 to get a 30% discount on Misfit's smartwatches (Vapor, Command, Phase, and Shine 2), fitness trackers (Ray and Flare), and accessories available in those countries. Misfit's page for this winter sale isn't live, though a cached version shows that the promo code is set to expire January 29th, 2018, at 11:59 p.m. PT, and is supposed to be limited to only a few of the products mentioned earlier in this paragraph. Those who live in these four countries may want to act quickly on this deal in case Misfit locks the discount down to fewer of its products or pushes up the end date when the official promo page goes live. The much anticipated and delayed Vapor is clearly the gem in all this. After the promo code is applied, the smartwatch comes out to €139.99 in Germany, Italy, and France, and £129.50 in the UK. The Vapor, which was 30% off on Amazon earlier this month, is powered by Android Wear 2.0 and has a 1.3" round AMOLED display (no flat tire here), heart rate sensor, 50m water resistance, and 4GB of memory. It also comes with a magnetic charging cradle and travel pouch. For those who live in the US, Canada, and elsewhere, use the promo code BEYOU to get 30% off of the Misfit Ray, Shine 2, and Flare (sadly, the Vapor is excluded). That's a more limited set of eligible products, but it's a solid price reduction nonetheless. This offer expires January 15th, 2018, at 11:59 p.m. PT. Regardless of where you live, taking advantage of these discounts from Misfit could be a nice way to start 2018, especially if you're making a health-related New Year's resolution.